If you’re an avid gardener, you know how important it is to keep all of your gardening equipment neat, organized, and in one place. You might choose to keep your larger gardening equipment in a garden storage shed, but if you spend a lot of time potting up plants or transplanting plants from one pot to another, you might want to invest in a potting bench. A potting bench is great for garden tool storage, organization, and it allows you to work with your plants at a reasonable height. With a potting bench, you won’t have to squat or hunch over to tend to plants - you can easily work with them on a level where you can easily see into a pot or garden planter. 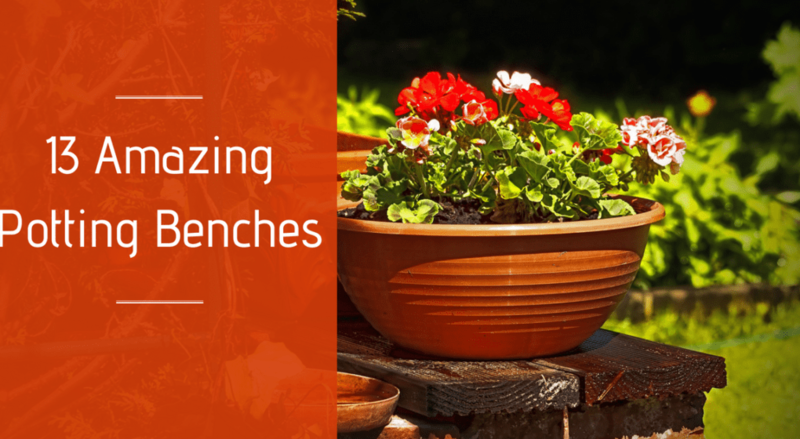 Check out some of these great potting bench options to see which one might be right for you. 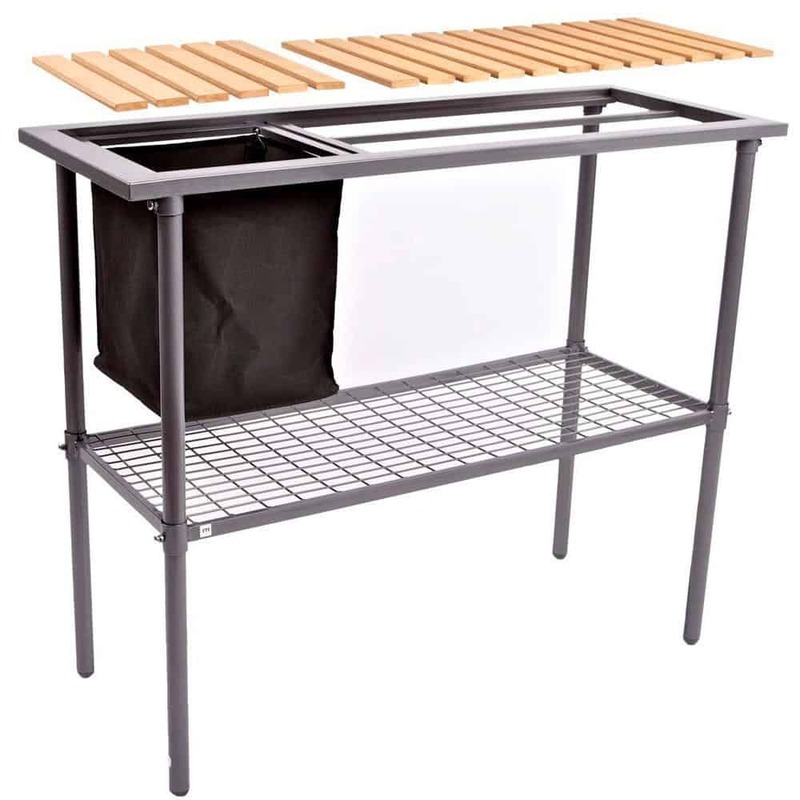 This sturdy metal potting bench will not only provide ample room for working with plants but it also features large storage shelves and hooks so you can keep things like potting soil, pots, and garden tools close at hand. It’s made out of a weather resistant material and is designed to add an artistic flair to your yard or garden. If you’re concerned about keeping your potting bench clean, this maintenance free vinyl options might be the right option for you. It can be easily hosed off or wiped clean and can be used for potting or for holding snacks and drinks at a backyard party. Its versatility makes it a great option for just about any yard. Made out of natural fir wood, this durable potting bench provides ample work space. It features a drawer for storing smaller gardening items and hooks to hang gardening equipment. It’s also fashionable enough to be used as a backyard bar cart or for decoration. 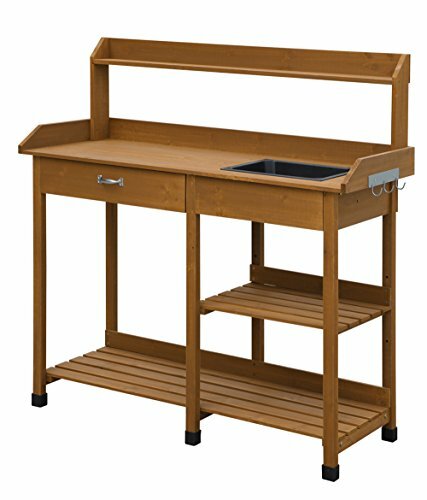 This potting bench is another durable and easy to clean option. It has a large lower shelf that’s perfect for holding light or heavy items. The working surface can be easily removed for cleaning, and there is no maintenance required for this potting bench. Almost too pretty to put outside, this stylish potting bench is made out of Shorea wood, a tropical hardwood similar to teak, and is naturally water resistant. 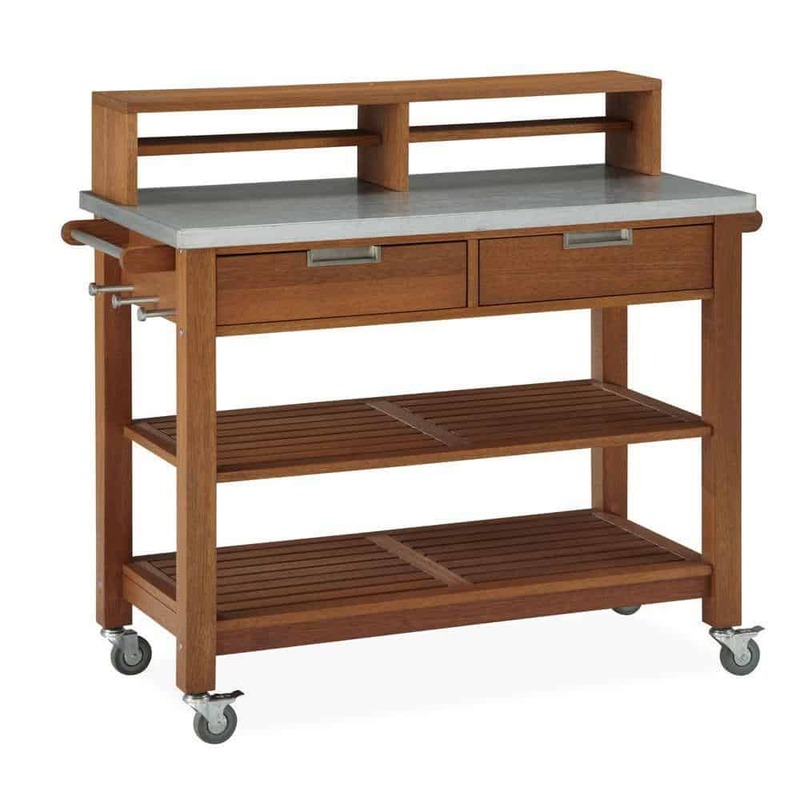 It has a stainless steel top that’s rust resistant and two large drawers for storage. 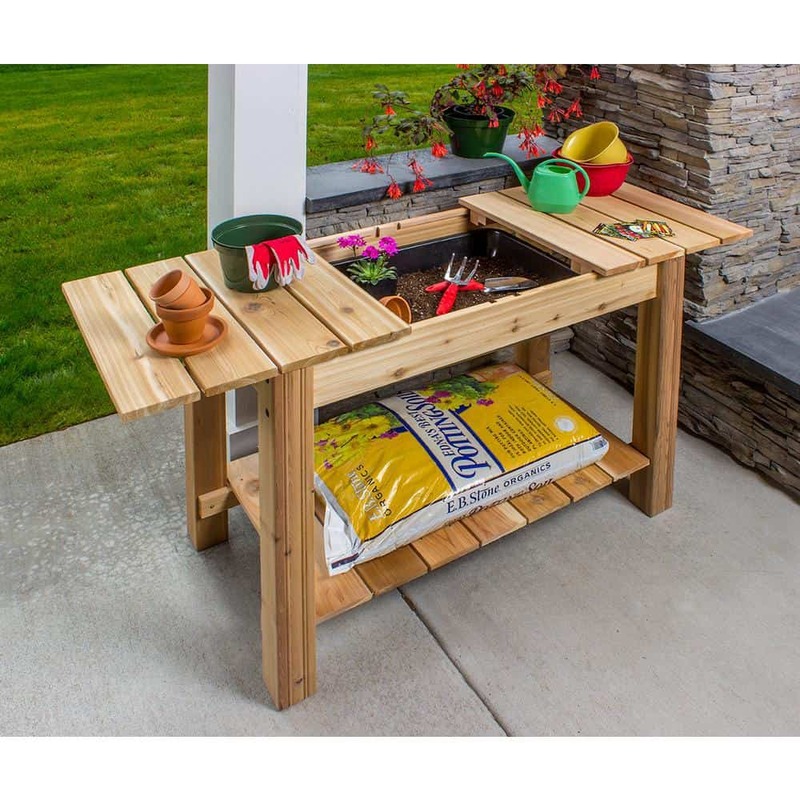 This is another potting bench that can be used for planting or backyard decor and entertaining. 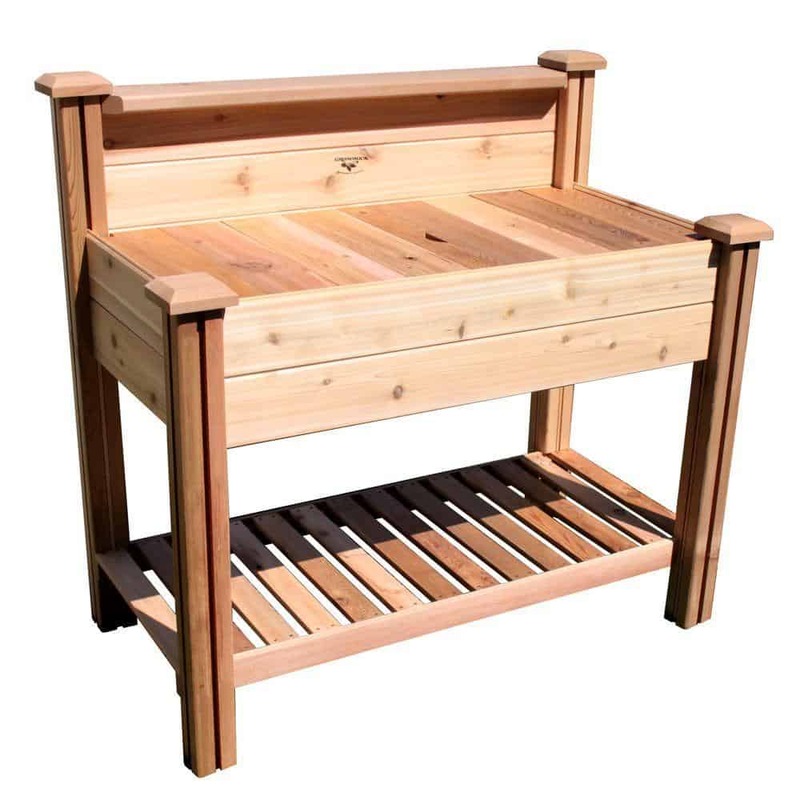 Made with all natural red cedar, this potting bench is designed to look timeless. It has a nice cedar smell but it can also be painted or stained to prevent weather damage. 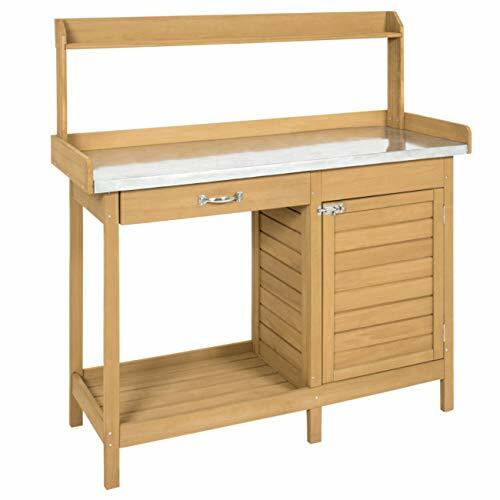 It has a sliding top that covers a large potting soil storage bin which can help you keep dirt in one place instead of all over the top of your potting bench. This rustic potting bench provides a large workspace and multiple storage options. There are both large and small shelves to keep gardening essentials close at hand, but there are also multiple drawers on different levels of the potting bench. 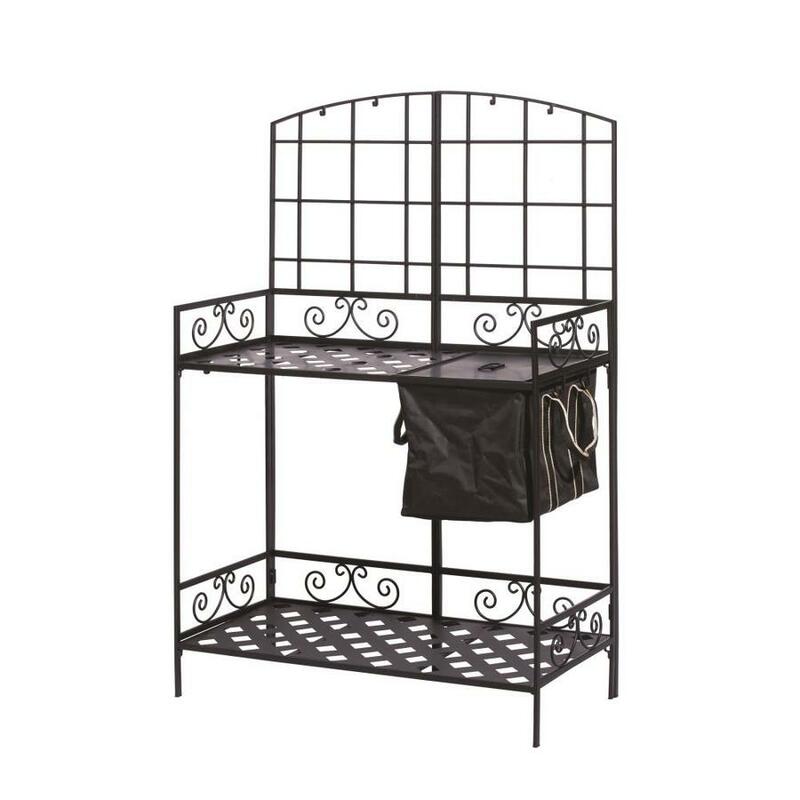 It has adjustable shelves that allow you to keep your gardening supplies behind closed doors which helps make cleaning up quick and easy. 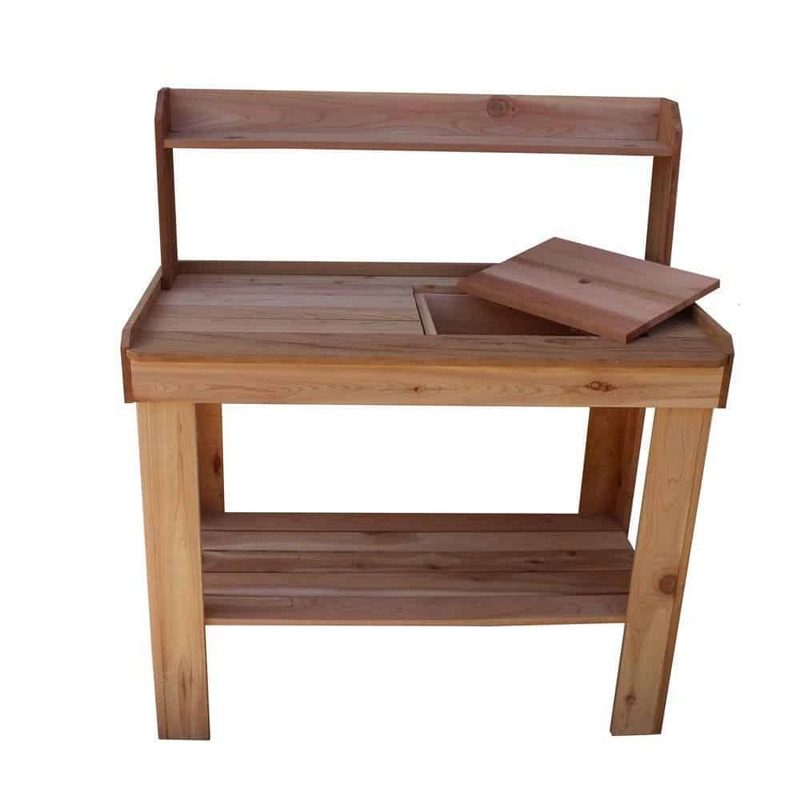 Available in both a fir and light oak finish, this solid wood potting bench has a super durable top equipped with a sink. 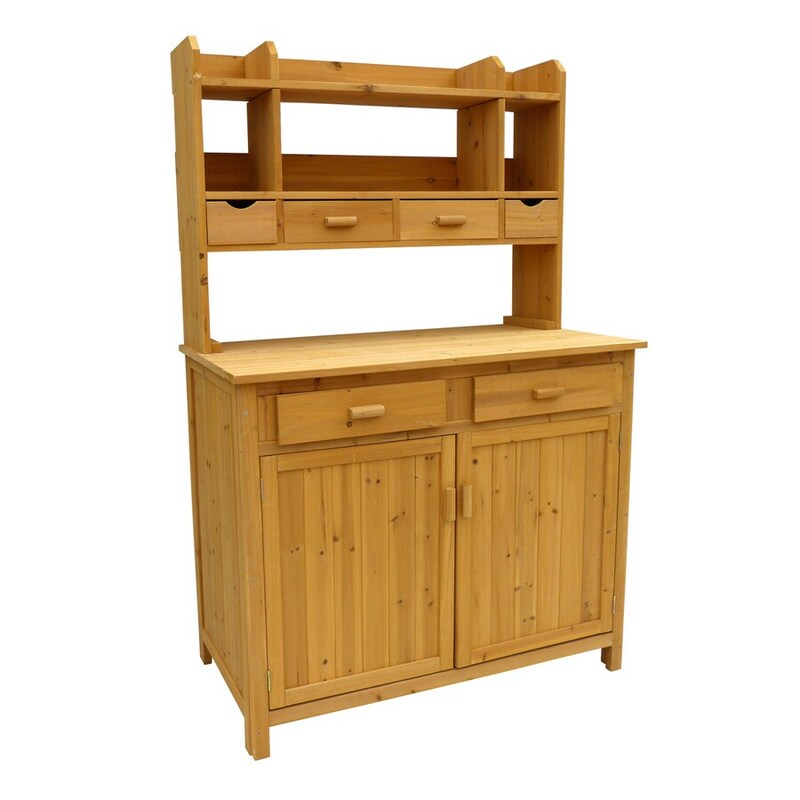 It has easily accessible open shelves, and has a drawer and hooks for extra organization. 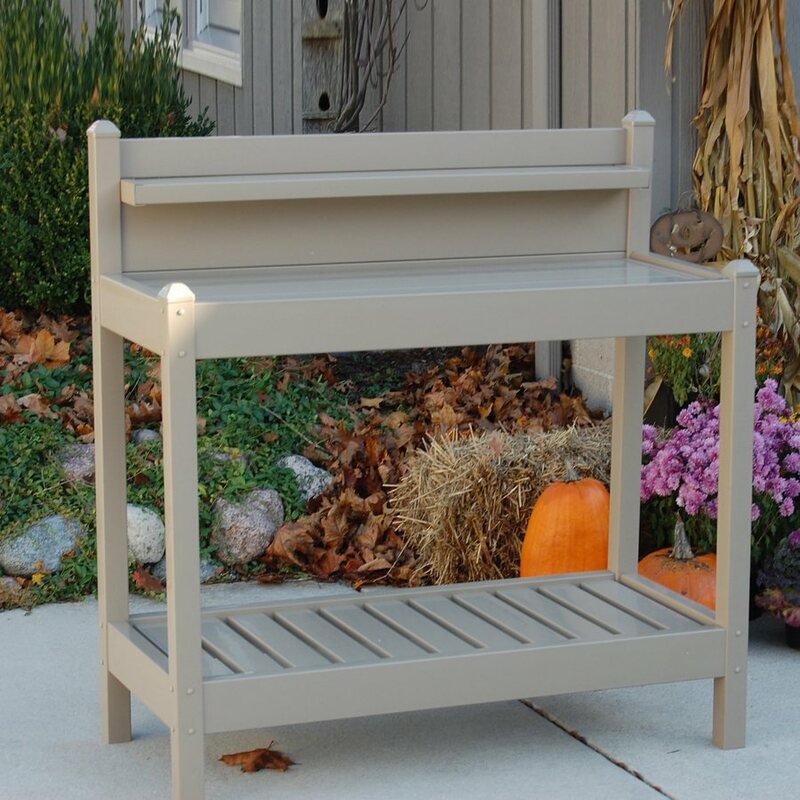 Designed to make clean up a breeze, this potting bench features a weather resistant metal top that provides a lot of gardening work space. 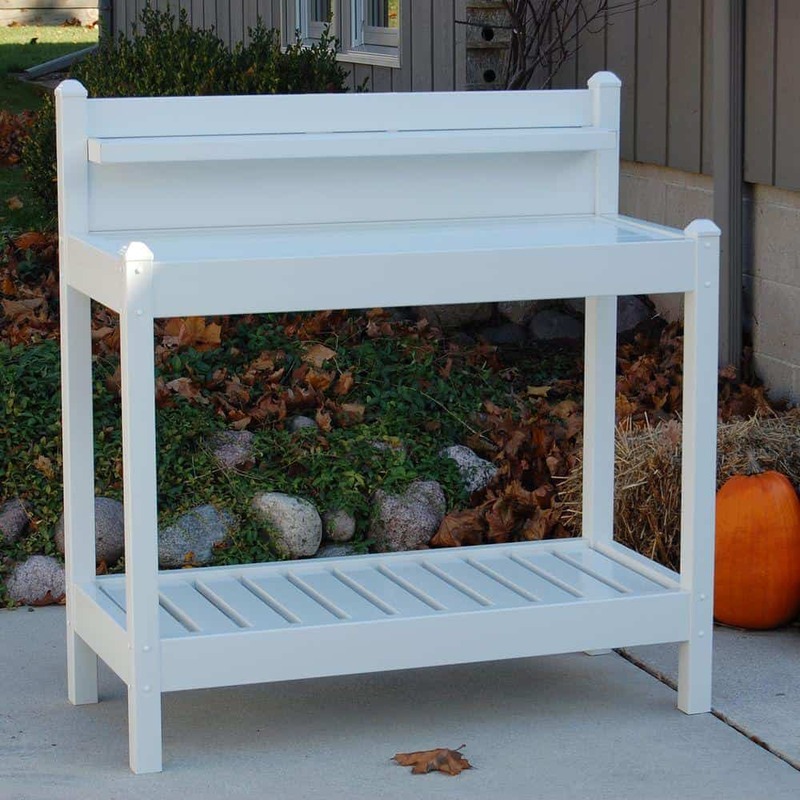 Made of solid fir, this bench can be painted or stained to match your backyard decor. It has a storage cabinet with a metal latch to keep its contents safe from animals or the elements and there’s also a deep drawer for additional storage. While this unique potting bench won’t win any design awards, it will get the job done. Made from recycled materials, this bench is an eco friendly option that’s weather resistant. It has a removable trimmings bin and a metal shelf that provides a large amount of storage. 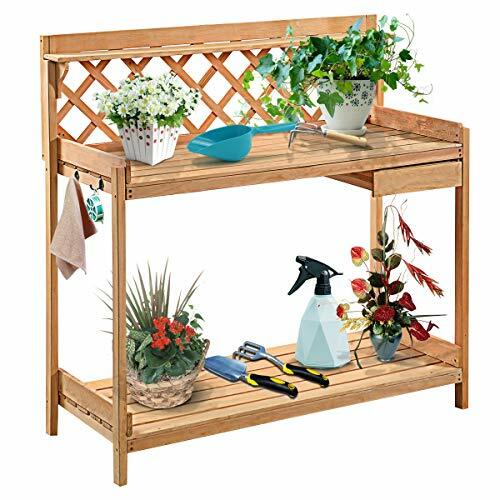 Easy to assemble and even easier to clean, this kiln dried solid hemlock wood potting bench has a solid top in addition to a lattice top, designed to catch dirt and debris or be used for storage. Both sides of the top can be removed for easy cleanup. This red cedar potting bench provides an oversized work space. Although it is unfinished, it can be easily painted to stained to protect it from weather damage or to match your backyard decor. 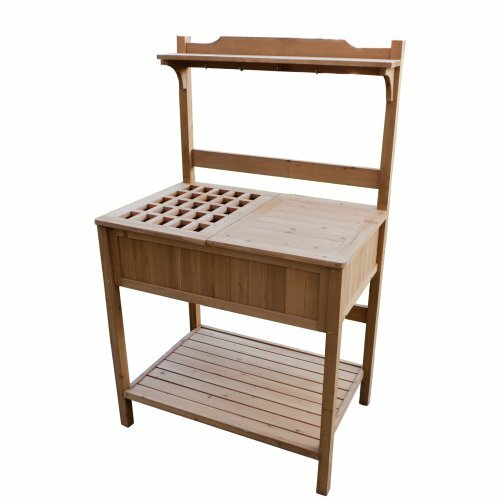 This potting bench may take additional time to assemble compared to other models, but it’s made out of cedar lumber that’s resistant to insects and weather damage. It has a built in sink that can be covered for additional work space and has multiple shelves for storage. Give your back a break and get your gardening gear organized with one of these fashionable and functional potting benches.